Sitting under the Bodhi Tree, looking out over a pixelated plain, I heard the voice of Deepak Chopra. Images of painted shapes — a lotus blossom, a glowing orb — appeared before me. The sky slowly shaded to sunset. Birds softly sang. When I looked down at where my body would normally be, there was nothing, only the dusty ground. Then painted figures, digital bodhisattvas — Buddhist saints, returned from the state of Nirvana to guide us lesser lights — fanned out into an infinity above and below me, reflected in a mirrored array. After 18 minutes of virtual enlightenment, when the experience had run its course, I pulled the Samsung Gear VR headset off my face and looked out into another reality. I was sitting on a couch at the sunny, open-plan offices of Wevr, a virtual reality production company, in Venice, CA. When I looked down, my body had returned, more relaxed than it was before. Outside, birds softly sang. Since coming to national attention in the early ‘90s after an appearance on Oprah, Chopra has built a multimillion-dollar business by promoting ideas of consciousness and holistic health that draw on quantum physics, transcendental meditation and other Asian religious traditions, including Buddhism (although Chopra himself doesn’t identify as Buddhist). Like other Oprah-adjacent gurus, Chopra has drawn on every available medium to spread his message to the American public. He makes countless public speaking engagements and TV appearances each year, has published over 80 self-help books, sells a range of ayurvedic healing products on his website and has written and starred in several movies based on his books. But virtual reality may end up being his medium of choice. The ideas that the world is not what it seems, and that there is no fixed self, only consciousness, are central tenets of most schools of Buddhist thought. These are the ideas of “dependent origination” — the teaching that things do not exist in and of themselves, but only as a result of a shifting network of other causes and conditions, endlessly interlinked — and “non-self,” or anatman — the idea that there is no permanent soul within each human, but rather an aggregate of sensory inputs and consciousness, constantly in flux. This doesn’t mean that reality is a simulation in the Matrix-y sense that Elon Musk means — that we’re just Sims running on a supercomputer somewhere out there in another real world — but rather that reality as we think of it is a simulation constantly running in our own heads, leading us to incorrectly believe that we are discrete selves, unlinked to the shifting flow of everything around us. Traditionally, Tibetan and Tantric Buddhists have used powerful, colorful paintings and statues as aids to help them visualize alternate realities: worlds where bodhisattvas roam the landscape, or an enlightened deity sits calmly on a lotus flower in the middle of a raging fire, unscathed. As the imagined world becomes more realistic, and bleeds into the experience of the everyday, the imagined nature of the real world is revealed. Now that VR works well enough to function not only as a visual aid, but almost a full-fledged imaginative visualization unto itself, Chopra is saying that the new goggle-enabled medium may give people a more immediate sense of the way our consciousness constructs our sense of reality. “By understanding the created nature of a virtual world, you’re able to see the created nature of the actual world,” says Gregory Grieve, professor of religious studies at the University of North Carolina at Greensboro, second-generation American Buddhist, and co-editor of Buddhism, the Internet, and Digital Media: The Pixel and the Lotus. 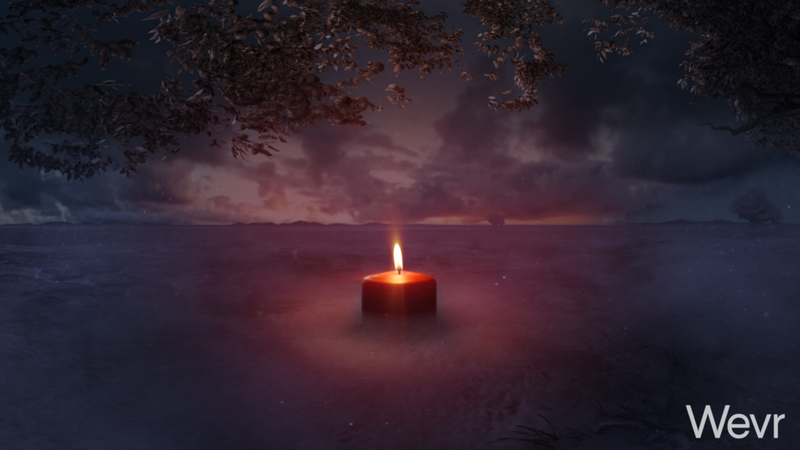 Grieve spent years studying a Zen Buddhist community on Second Life, where users regularly met in a simulated hall for silent meditation, their avatars sitting quietly on-screen. And even though these virtual Buddhists didn’t have the benefit of high-resolution VR headsets, he found that the social aspect of virtual presence — the ability to imagine that you were actually in a room with other meditating practitioners — created a similarly immersive sense of created reality. 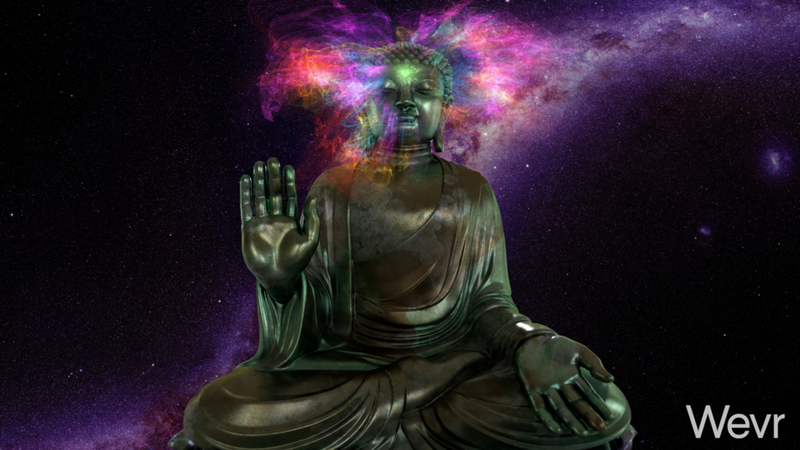 And in a sense, it’s no surprise that virtual reality, whether in immersive goggles or immersive online communities, seems to mesh with the American way of practicing Buddhism: Its emphasis on meditation for non-monks and cultivating mindfulness comes out of the same set of ideas that led the Silicon Valley tech industry to make virtual reality a technological reality. On a surface level, it’s clear that tech people are into Buddhism. Steve Jobs was a practicing American Zen Buddhist, Mark Zuckerberg seems to be leaning towards the dharma, and in some corners of Northern California, Buddhist practice functions as career networking. There are countless business management books with Zen in the title, and there are hundreds of smartphone apps (and a handful of popular programs for the nascent VR market) with names like Buddhify, Headspace, and iMindfulness available for download. Cybernetics was first popularized by Norbert Wiener in his 1948 surprise bestseller, Cybernetics: or Control and Communication in the Animal and the Machine, where he used the term to refer to the study of systems that are locked in some kind of feedback loop. The word itself comes from the ancient Greek kybernetes, meaning “the steersman of a boat” — the idea is that, like the steersman making subtle shifts of the rudder to change the ship’s direction, we can change the looping feedback systems of the world around us with subtle changes in input. These systems can be economic, electrical, ecological, biological, psychological — you name it — and this line of thinking inspired the development of learning algorithms and AI, computer vision, and the vast, connected system of the internet. From Buddhism’s first stirrings in NorCal culture, when the British emigre Alan Watts published the bestselling The Way of Zen in 1957, American Buddhism was borrowing ideas for cybernetics. Watts called the heightened consciousness of meditation a “‘feed-back’ system” that worked like a home thermostat, cribbing a metaphor directly from Wiener’s Cybernetics. And just as an electrical engineer can tinker with a circuit to make it “learn” as it loops back on itself, or a manager can take feedback from employees and clients to maximize workflow efficiency, the student of mindfulness can alter the mind to optimize the flow of consciousness. Put another way, VR and American Buddhist mindfulness meditation are both programs running on the same operating system — as the newest, most powerfully immersive iteration of Silicon Valley’s technological advance, VR is a natural medium for its cybernetic sibling. Anthony Batt agrees. 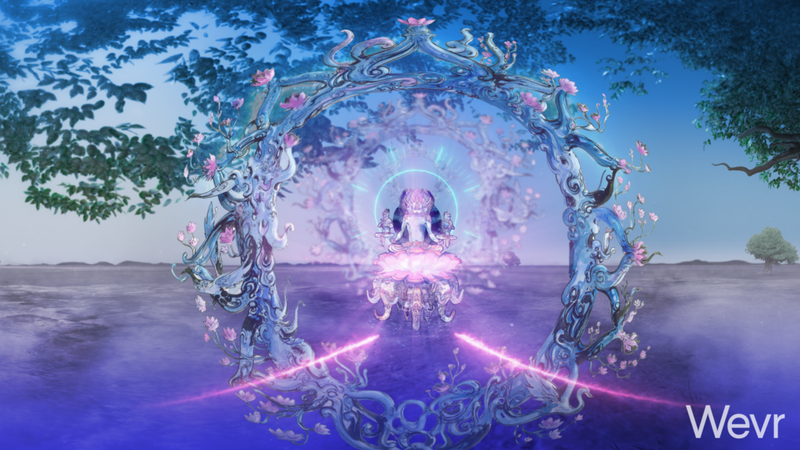 In the short term, Wevr is working on more guided meditation simulations with Deepak Chopra — the Bodhi tree and space Buddha experience I got to try out is only the first in a series of eight. And in a VR landscape crowded with video games and interactive film-like experiences, Batt thinks that simulations like Chopra’s, that use the immersive power of VR to change the user’s state of mind, could be a big part of his company’s future. Finding Your True Self will be available in October for $10 on Transport, Wevr’s app for the Gear VR and the higher-end HTC Vive headset system.